The gaming press are rarely interested in the boardroom chat of big publishers. The talk is dry, involves big numbers, and the chance of a good biscuit is practically nil. However, that often means we miss out on the talk of daring midnight-raids involving gyrocopters flying low over the Wien river. If the reports are true, this is exactly what Double Fine did to secure the distribution rights to Costume Quest and Stacking, two of their games which were bundled up and sold to Nordic Games during the auction of THQ’s assets. When it went to auction Nordic acquired the lion’s share of THQ’s licenses. The biggest of these was Darksiders but, importantly, this also included Double Fine’s darlings. Well, today, through the medium of press release, we learned that Double Fine has managed to acquire those all-important rights. “I am pleased that we have regained full control over Costume Quest and Stacking, following a daring and top-secret midnight raid on the Nordic Games headquarters in Vienna,” said Double Fine president and CEO Tim Schafer, while stroking the stuffed owl normally sat above the desk of Lars Wingefors, owner and CEO of Nordic Games. Not only have Double Fine regained the rights (and taken Wingefors owl) but they’ve penned a deal to have Nordic sell Psychonauts, Costume Quest, and Stacking in brick and mortar shops next year. 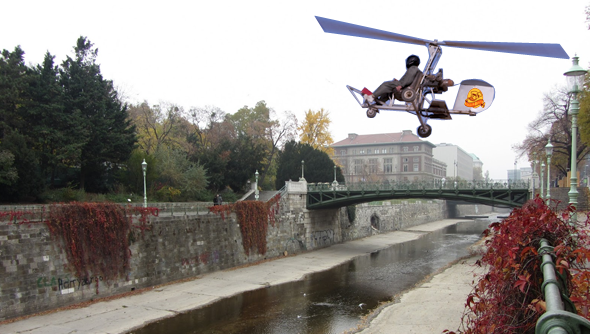 Although the press release makes no mention of gyrocopters, our Viennese correspondent reports that a swarm of at least 40 of the machines flew low up the Wien river blaring out a variety of polkas from their onboard sound systems. Further quotes from Double Fine and Nordic stand only to support the reports of shadiness we’ve received. It’s great to see Double Fine gaining control of their IPs but hopefully in future the indie developer can do so without bloodshed.